The latest weekly United States Mint numismatic product sales report includes the debut figure for the Great Sand Dunes Five Ounce Silver Uncirculated Coin. Elsewhere in the report, the 2014-W Uncirculated Gold Eagle saw a surge in sales and several products have recently sold out. 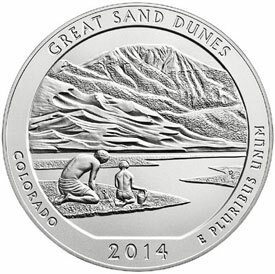 The US Mint opened sales for the 2014-P Great Sand Dunes National Park Five Ounce Silver Uncirculated Coin on September 15, 2014. The 3 inch diameter coins feature a reverse design depicting a father and sun playing in the sand next to the creek bed with the distinctive mountains and sand dunes of the park in the background. The coins were priced at $154.95 or $139.45 for orders fulfilled through the US Mint’s online subscription program. Elsewhere in the report, the 2014-W Uncirculated Gold Eagle saw a large jump in sales with 1,061 units ordered during the week. This represents the highest weekly sales total since the coins debuted back in May. Cumulative sales for the coin have now reached 5,403 units. In recent years, some collectors have looked to the collectible uncirculated Gold Eagles as a potential low mintage play. The current low mintage for the series is held by the 2012-W Uncirculated Gold Eagle at 5,829. A few numismatic products have recently sold out at the US Mint. The recently released 2014 Franklin D. Roosevelt 100-coin bags for the Philadelphia and Denver Mint have both sold out. Last reported sales are 1,989 and 1,982 units, respectively. The 2012 Birth Set has also sold out with last reported sales of 49,666. The 5829 is the number of coins the usmint itself announces on its website. If 2014 shall be the new benchmark stop ordering. APMEX is stating that the Arches 5 oz. silver bullion coin is “Sold out at the U.S. Mint.” Any idea if this is true? The Mint only shows that 22,000 have been sold so far. Interesting. I will see what I can find out. Thanks for the latest update, Michael. Not surprised with the consistency in the opening sales of the Great Sand Dunes as compared to the other ATB-P 5 oz coins. However, I’ll be very interested to see how sales trend for Everglades trends in November – but several weeks after that sweet subscription discount ends in October. Seriously US Mint?? You couldn’t wait for that last 2014 coin to be issued?? WIthout the discounted subscription price, I expect opening (3-5 day) sales for the Everglade ATB-P to be 13K to 15K units. Michael, thanks for all your efforts. When you check with the US Mint about the possible sell-out of the Arches 5-oz coin, could you also ask about the maximum mintages of the bullion ATB coins? The last reported max mintage was for the Great Smoky Mountains at 40,000, and unless I missed them, there has been no offical reported max mintages for the other 2014 ATBs. Yes, I have asked if they would provide maximum mintages on the other ATB bullion as well. Was able to get sub in for Everglades…Can’t wait! @ FMTx – you might want to read some of the recent MNB threads about the upcoming US Mint website upgrade. As I had commented above, the discounted subscriptions will be CANX concurrent with the migration to the new e-commerce site. Currently no indications that the Mint intends to reinstitute any of the discounts once the migration is complete. Apparently, the Mint seems to think the resurgence in ATB-P sales is due solely to the “great” designs so, now, they want to reclaim the clear profits against these burgeoning sales. As good as that Everglades design is, I think the lack of discount will keep opening sales below 15K. There’s also the unanswered question of whether or not we customers will need to re-establish our various subscriptions after the migration is complete.